Modification: A - 092 N6. The city low - floor bus of a small class on the basis of Isuzu. Prednaznachen units for city transportations. Guarantee: 2 years (100 thousand km); Wheel formula: 4х2; Length/width/height: 8220/2320/2700 mm; Full weight: 8780 kg; The Equipped weight: 5240 kg; Fuel consumption: 14 - 15 l / 100км; Engine: ISUZU 4HK1 - E5NC the diesel, four - cycle, with common rail; with turbonaduvy Working volume: 5. 193 l; 4 cylinders, line. Power: 154 (h. p. ) ; Compliance to environmental standards: EURO - 5; The Cooling system - liquid; Capacity of a fuel tank - 118 l; Transmission: ISUZU - MZZ6U, mechanical, 6 step, synchronized; Chassis and Steering: ISUZU, Japan; Power steering, ABS category 1. 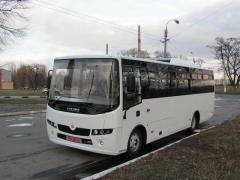 Passenger doors mechanical double - wing in number of 2 pieces of Pasazhirovmestimost 49 - 52 persons; Number of places for sitting – 14 - 17 (optionally + 4 folding) persons; System of heating: autonomous; Type of seats: polumyagky; Wheels / Tires: 215/75 R 17, 5. 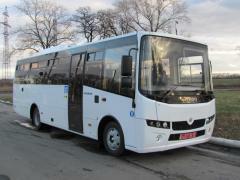 The DEALER OFFERS NEW BUSES the ATAMAN AT the PRICES of MANUFACTURER. CREDIT. LEASING. 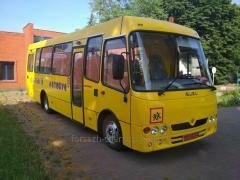 Unbelievable price on The city bus Bogdan And - 092H6 in Cherkassy (Ukraine) company Predpriyatie "FORSAZh".